Do you like working with crochet cotton thread and making treasured items? 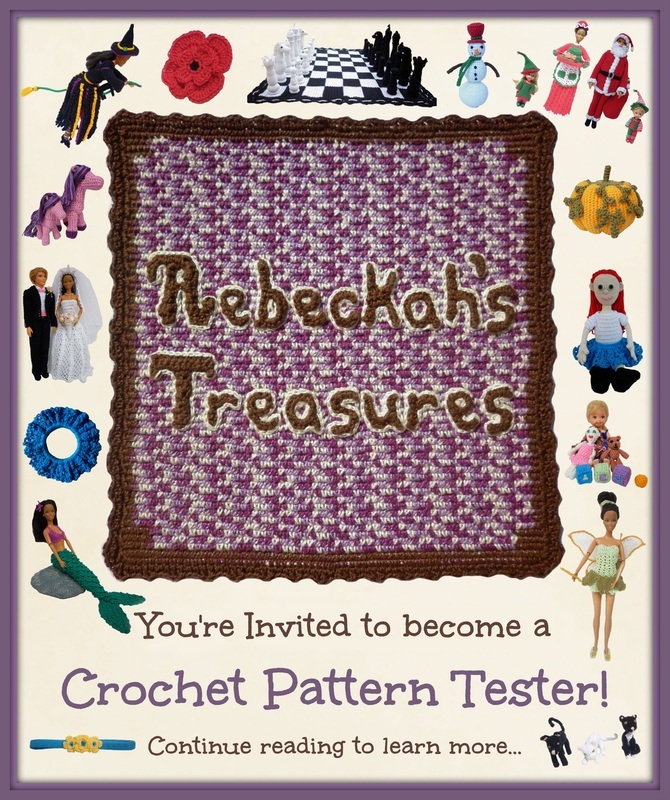 Would you like to test crochet patterns for Rebeckah's Treasures? If you decide you would like to become a tester, you will first need to send in an application, and wait to see if you will be accepted. Once you have been accepted, you will be invited to a "Secret Facebook Group". There testing opportunities will be announced, and you will have the opportunity to sign up to test any pattern you would like to test. *If you are NOT on Facebook, we may be able to make other arrangements. You will be sent portions of the pattern for testing, and after each portion completion, you will be sent the next part. As a Rebeckah's Treasures' Tester, you will be expected to complete the pattern testing by the set deadline AND to keep the pattern you are testing confidential until such a time as it is okay to share it. You will need to look out for any technical/grammatical errors and for anything that doesn't make sense in the pattern. Wherever necessary, make suggestions, and let me know whenever you think a photo tutorial would make things clearer. You will need to send in progress updates as you work. Plus, once you have finished testing the pattern, you will also need to send in a picture of your work as proof of test completion. In return for testing crochet patterns, you will receive a free copy of the official pattern you tested. *Please note: I choose testers based on who I think will best represent Rebeckah's Treasures. Not all applicants will be accepted, and only loyal testers will be kept.